B. The Green Revolution produced food for the earth’s growing population as it spread chemically and genetically enhanced forms of agriculture. D. Energy technologies including the use of petroleum and nuclear power raised productivity and increased the production of material goods. II. During a period of unprecedented global population expansion, humans fundamentally changed their relationship with the environment. A. As human activity contributed to deforestation, desertification, and increased consumption of the world’s supply of fresh water and clean air, humans competed over these and other resources more intensely than ever before. B. The release of greenhouse gasses and other pollutants into the atmosphere contributed to debates about the nature and causes of climate change. I. Europe dominated the global political order at the beginning of the twentieth century, but both land-based and transoceanic empires gave way to new states by the century’s end. A. Nationalist leaders in Asia and Africa challenged imperial rule. (Examples of nationalist leaders and parties: Indian National Congress (INC), Ho Chi Minh in French Indochina (Vietnam), Kwame Nkrumah in British Gold Coast (Ghana)). D. Movements to redistribute land and resources developed within states in Africa, Asia, and Latin America, sometimes advocating communism and socialism. A. World War I and World War II were the first “total wars.” Governments used ideologies, including fascism, nationalism and communism, to mobilize all of their state’s resources, including peoples, both in the home countries and the colonies or former colonies, for the purpose of waging war. Governments also used a variety of strategies, including political speeches, art, media, and intensified forms of nationalism, to mobilize these populations. B. The sources of global conflict in the first half of the century varied and included imperialist expansion by European powers and Japan, competition for resources, and the economic crisis engendered by the Great Depression. C. The global balance of economic and political power shifted after the end of World War II and rapidly evolved into the Cold War. The United States and the Soviet Union emerged as superpowers, which led to ideological struggles between capitalism and communism throughout the globe. V. Although conflict dominated much of the twentieth century, many individuals and groups — including states — opposed this trend. Some individuals and groups, however, intensified the conflicts. The twentieth century witnessed a great deal of warfare and the collapse of the global economy in the 1930's. In response to these challenges, the role of state in the domestic economy fluctuated, and new institutions of global governance emerged and continued to develop throughout the century. 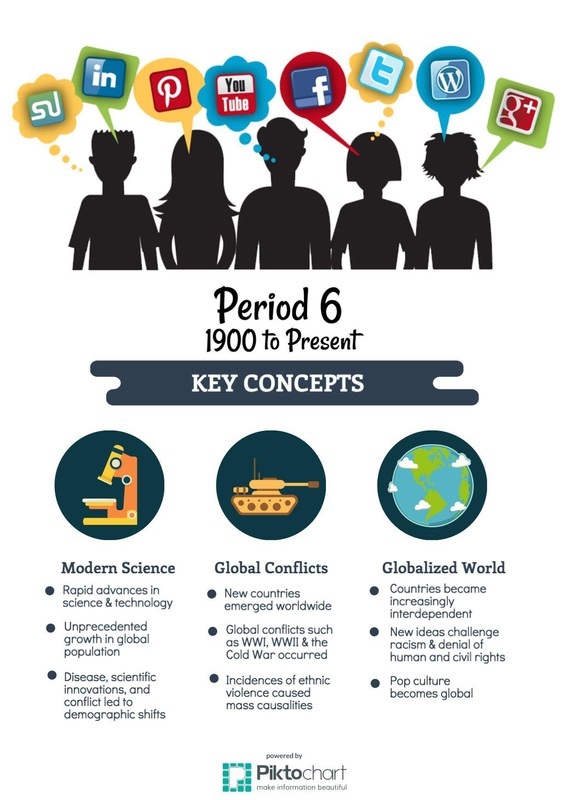 Scientific breakthroughs, new technologies, increasing levels of integration, changing relationships between humans and the environment, and the frequency of political conflict all contributed to global developments in which people crafted new understandings of society, culture, and historical interpretations. Institutions of global governance both shaped and adapted to these social conditions. III. People conceptualized society and culture in new ways; rights-based discourses challenged old assumptions about race, class, gender, and religion. In much of the world, access to education, as well as participation in new political and professional roles, became more inclusive in terms of race, class, and gender. Illustrative examples of increased access to education and political and professional roles: the right to vote and to hold public office granted to women in the US (1920), Brazil (1932), Turkey (1934), Japan (1945), India (1947), and Morocco (1963); the rising rate of female literacy and the increasing numbers of women in higher education, in most parts of the world, the end of apartheid, caste and reservation in the Indian Constitution of 1949.